As an individual who has worked on hundreds of Google Apps deployments, one of the most intriguing milestones to me personally is the “Go Live” date, which the first day end users are 100% on the Google Apps for Work platform. The reason this day is so fascinating to me is not because it marks the near conclusion of the project lifecycle (which it does), or because there are numerous tasks and subtasks that come to a head at the same time (which there are), but because I am able to interact with end users directly and watch their everyday workflows adapt to a modern solution. I’ve seen users coming from legacy platforms who leverage the sent mail folder to keep track of tasks, users who employ some 3rd party solution such as Trello or Notepad to manage tasks, users who create calendar events for a task list to reference, and even users who bookmark specific web links on a temporary basis throughout the day to keep things straight. The list goes on and on. What makes this so interesting to me is how creative (without even realizing it) the vast majority of people are when finding ways to remain organized with day-to-day activities. Think of it this way: generally there are guidelines or even strict rules that dictate how you should do your job. 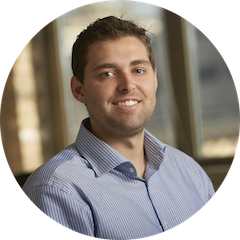 Whether it’s entering sales leads in a CRM, managing resources with an ERP, completing specific financial applications on behalf of customers, or generally accepted workbook formulas for pulling metrics, each job function has a stated workflow. Except, of course, task management. During the workday you may use a CRM, manage an ERP, and pull metrics using certain, documented formulas, but I seldom come across a company that dictates how these tasks are organized or managed (the glaring objections being an employee who lives out of a ticketing system or someone assigned all tasks from a project manager). This leaves each employee to discover a task management method on their own. 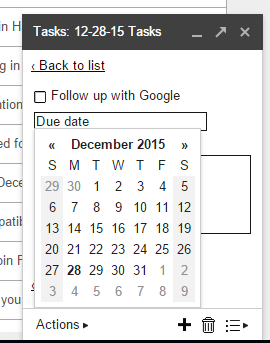 Enter a universal option for all, Google Tasks. 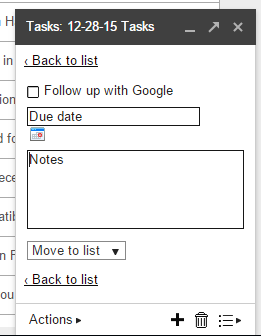 1) Marty is looking for an easy way to list tasks as they come up and cross them off as each task is completed. Marty is using the Gmail interface. 2) In this example, Marty not only wants to create a task, but also assign a date to that task, so it reflects on his calendar. 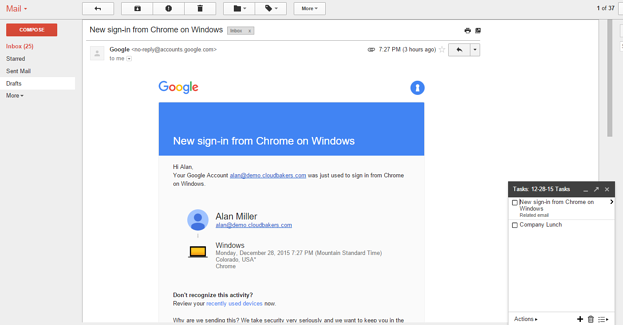 3) In this example, Marty creates a task directly from an email. 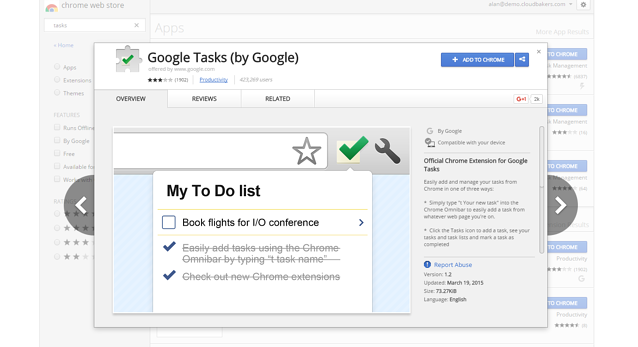 Google Tasks is an easy, unified solution to managing your day-to-day activities and projects. 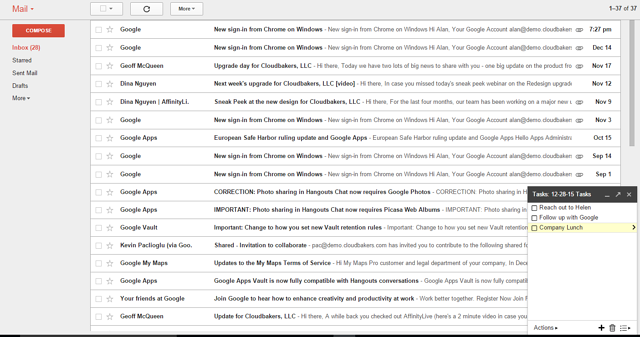 It is integrated and intuitive, and already available to Gmail users. Start using it today!